A longhouse in the Mnong village of Buôn Jun in the Central Highlands of Vietnam. The Mnong or Munong (Vietnamese: người Mơ-nông) are an ethnic group from Vietnam (92,451 in 1999) and Cambodia. A number of Mnong live in the eastern Cambodian province of Mondulkiri. 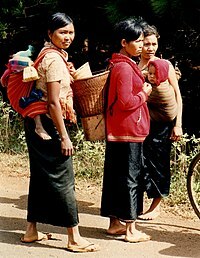 Every group speaks a variant of the Mnong language, which is in the Bahnaric languages group of the Mon–Khmer language family. Epics (Mnong language: Ot N'rong- Ot: telling by singing the poem, N'rong: old story) take an important part in Mnong people's life. Many of these epics, such as Ghu sok bon Tiăng, are quite long. ^ "The 2009 Vietnam Population and Housing Census: Completed Results". General Statistics Office of Vietnam: Central Population and Housing Census Steering Committee. June 2010. p. 134. Retrieved 26 November 2013.